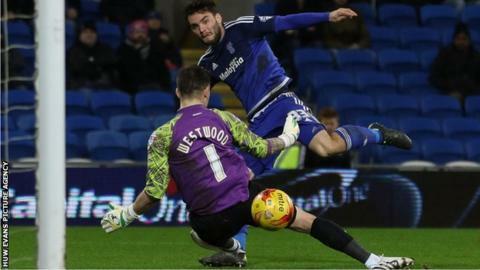 Cardiff City are confident of keeping Charlton striker Tony Watt beyond his loan deal, BBC Wales Sport understand. Watt, 21, has scored twice in five appearances since joining from Charlton on a deal due to expire on 16 January. Senior sources now say a deal is in place for the former Celtic striker to make a permanent switch to Cardiff. Meanwhile, the Bluebirds have recalled striker Alex Revell from his loan at Wigan Athletic, which was due to run until 23 January, for personal reasons. Manager Russell Slade has already said he wants to hold on to the former Scotland under-21 international Watt, who also had a spell at Standard Liege. Cardiff are also attempting to negotiate a new deal with Trinidad and Tobago striker Kenwyne Jones, who has scored five times in the Championship this season. But it is by no means certain they will be able to conclude an agreement. Meanwhile, businessman Michael Isaac has been removed from the board of Cardiff City Football Club. His departure happened at a meeting of shareholders held today. Isaacs remains on the board of the club's holding company.